As a Boston-based company, the tragedy at the Boston Marathon really hit home. The recent creation of the prosthetics division gives us a great opportunity to serve many of those victims who received their prosthetic limbs from one of our clients, a local prosthetics company north of Boston. Not to mention the wounded veterans from the last dozen years of conflict overseas. Led by industry solutions expert, Rick Piracini, Emerson Bearing's knowledgeable prosthetics team assists clients in determining which bearing technologies would be most suitable (Control bearings are ball bearings that allow the client to replicate the movement of the ankle). This starts by taking into consideration the specifications, recommendations, maintenance strategies, fatigue life and wear resistance of the bearing in relation to the prosthetic. 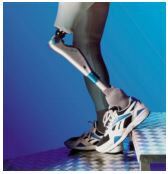 All prosthetics bearings receive the highest scrutiny for effectiveness and durability. All movements have to be supported with extremely high precision and reliability in every axis. This provides smooth running, high load capacity, rigidity and long life. For more information for bearings for prosthetics, you can contact Rick Piracini in the Robotics and Automation division directly at 866-995-8765 or email rickp@emersonbearing.com.